For the past 2 weeks we have entered the world of laminating, steam bending and veneering. Here are pictures from the steam bending demo. And, well, yes you steam a piece of wood and then bend it. 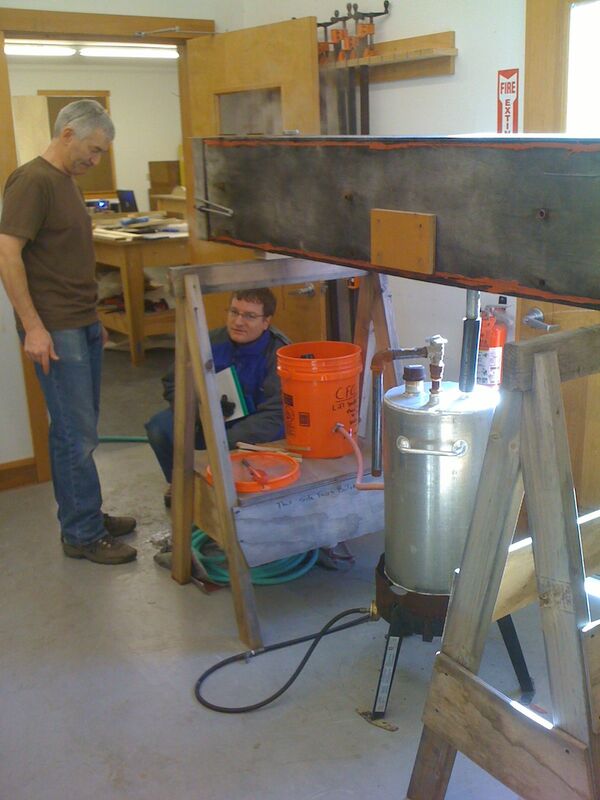 It is all very Rube Goldbergesque: the steamer is this long box that is rigged up to a boiling lobsterpot with the top welded on and over a propane burner. The lobster pot is fed water from a bucket with a toilet float which is fed water from a hose attached to the bathroom sink. Okay..., never-mind. A hot hot hot piece of wood is taken out of the steamer after it has had a good long shvitz and with great group effort, put into a contraption and bent around a form. There is plenty of scurrying, ratchetting, clamping, holding down the table which is heaving and bucking, etc. And then the wood may break or in the long run, unbend a bit so it isn't for all bendie furniture. Laminating wood and bending it is for when you need it all to be to your will or as Tim Rousseau says "when you need to put the boot down". You glue a bunch of pliabe layers of wood together and bend it around a form, holding it with clamps or another form or putting it in a vacuum bag til it knows who's its daddy. 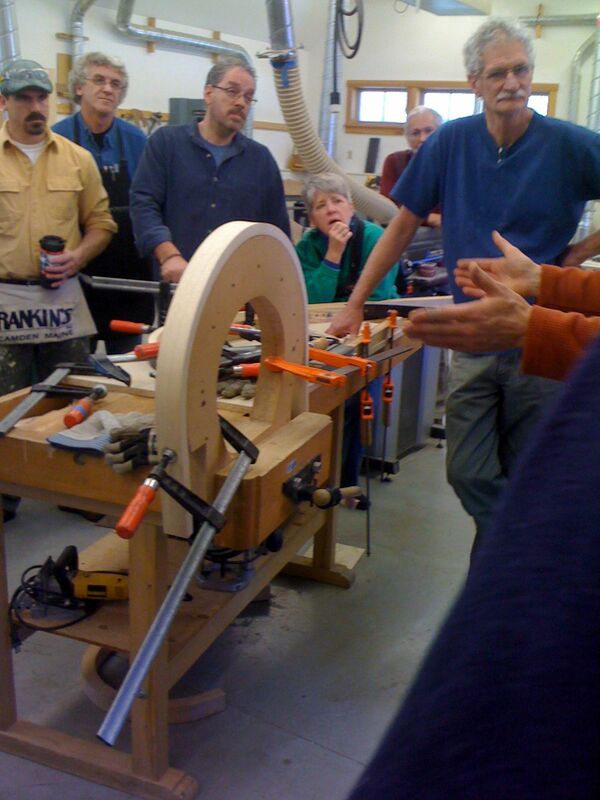 There are a whole lotta gizmos involved and form making and jig making to make the forms before you even have bent a piece of wood that will eventually become part of furniture. My head feels like it is about to explode. 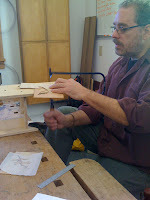 Then there is veneering, which is super thin pieces of wood glued onto a flat surface. The thing about veneering is, you have a wood surface which won't really move and you can create your own woodie look. But the best thing about it is this beautiful marquetry that can be put into the veneered surface. 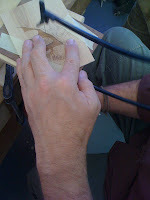 Here is the remarkable Craig Vandall Stevens demonstrating marquetry by making an oak leaf. It was fascinating and I can't wait to try it even though I have the sinking feeling that it may make doing perfect hand tooled half-blind dovetails seem like a walk in the park, can of corn, piece of cake. My new project is a walnut desk/table with a rounded, veneered top. I would like to put a small bit of marquetry in it. I was going to steam bend the legs and laminate the front apron and put in a drawer but we only have two and a half weeks left so ambitions are falling by the wayside, and honestly, I don't think I can cram that much more info into my head.